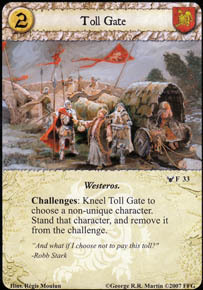 Flavor Text: "And what if I choose not to pay this toll?" Anyone else think this would be good for Lannister Black Sails? Does the character have to be kneeled? My thought would be no. The character has to be a "non-unique, participating character". So long as the character meets that criteria, knelt or un-knelt does not matter. At least thats my opinion. Let me know if anyone disagrees! This is similar to how Frozen Outpost can Stand a knelt character that can't have their STR boosted, or can boost the STR of a character that is already standing, or both. Because it doesn't use the "then" clause, both the "stand" and "remove" try to happen regardless of if the other was successful or not.